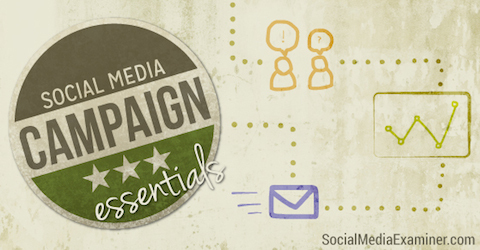 Do you need to set up a social media campaign? Establishing a strong team and a day-to-day plan are important for any successful social media campaign. In this article I’ll show you the five core elements you need to build a social media marketing campaign that works. Throughout this article I include examples from a campaign Whole Foods Market used when they launched a new larger store in Memphis, Tennessee to replace an existing smaller one. The Whole Foods Poplar store opening makes the news. The campaign’s goal was to keep the Memphis community informed about overall progress, when the old store would close, when the new one would open, new offerings and opening-day activities. Early iterations of social media community management often included a laissez-faire approach: Give it to the younger staff members—they’re on social, right? Businesses quickly found out that just because someone is on Facebook in their personal life doesn’t mean they intuitively know how to communicate on behalf of a brand. Bernie Borges‘ article on staffing strategies points out the importance of assessing the people on your team and determining who is best-suited to contribute to your social media strategy. Social media marketing requires specific skills (e.g., writing and editing, photo editing, a little tech know-how and being able to respond in real time). 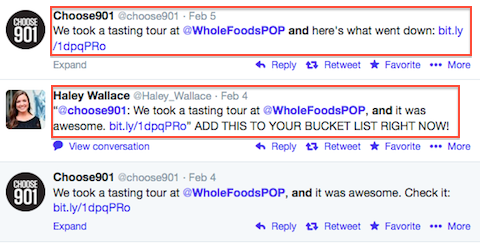 Whole Foods Poplar fans tweeting about their experience taking a tour of the new store. Establish a social community management team with members who can take ownership and responsibility for carrying out day-to-day updates in addition to long-term campaigns. 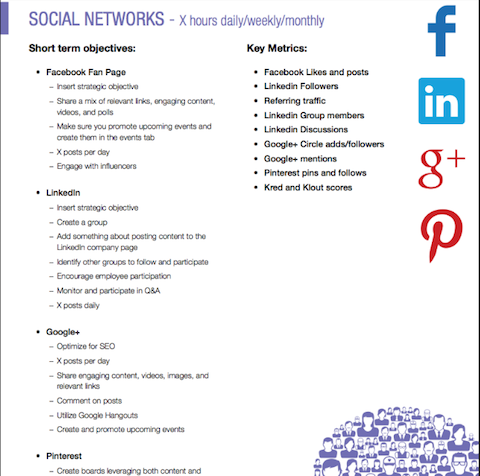 Create short- and long-term goals and objectives for your social marketing campaign. A planned campaign is a successful campaign. Your plan keeps you focused on the number of steps you’ll need to take along the way, while also helping build momentum, curiosity and excitement among your audience. No matter what you hear from different sources, there is no one perfect social media platform to use. What works well for one business may not work well for another. To choose your primary and secondary networks, think about where your target audience is more likely to spend time online and look at industry benchmarks. 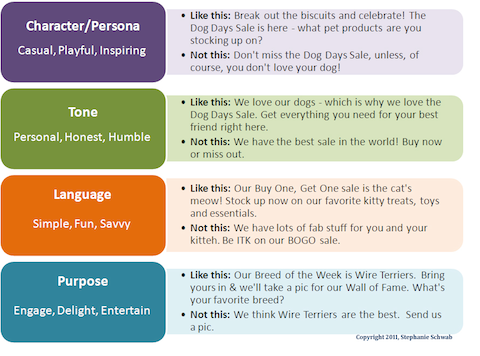 Social Barrel designed an infographic that shows specifics to consider: suitable media types, objectives, potential reach, demographics, target profile and the types of skills your team needs to be successful. 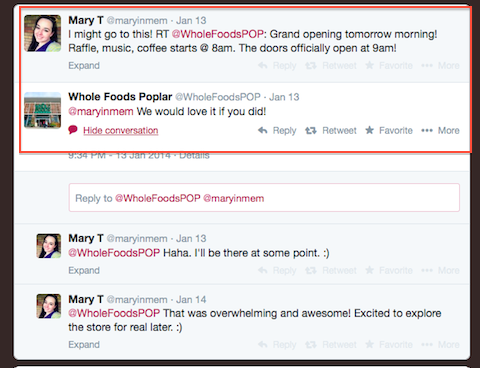 Whole Foods Poplar responded to followers on Twitter. It may sound obvious to be where your customers are, but for some businesses that’s easier said than done. If you’re not sure where your audience is, set up social interaction reporting on Google Analytics to see which channels send visitors to your site. Take the time to discover where your target audience hangs out online. When you have the right mix of platforms, your campaign has a better chance at success. Print publishers have used editorial calendars for centuries and their usefulness has never waned. They help you leverage content across media, streamline resources, drive internal teamwork and stay focused on the needs of your audience. If you already have an editorial system in place, you’re ahead of the game. If you don’t, this free customizable Excel template can help you get started. If you want toshare your calendar with your team, consider a Google Drive spreadsheet orWordPress’ editorial calendar plugin. Editorial calendars help keep your content delivery on track. 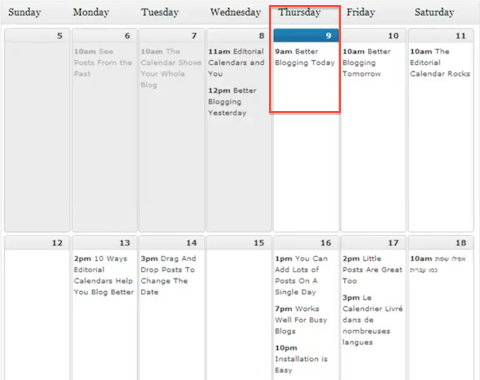 Image from WordPress Editorial Calendar plugin. You may also want to include a place for written updates (exactly what you’ll post for easy cutting and pasting), where and when you’ll post each update and which team member is responsible for the update. When your audience reads and listens to the content you produce, they’re not only hearing your message, they’re hearing the voice of your company—your tone, language and delivery (i.e., formal vs. conversational). Each time they hear your brand voice, it’s a good bet they’re subconsciously sizing you up. They’re deciding whether you’re a company they can rely on, and more importantly, do business with. Create a voice for your company, image created by Stephanie Schwab. Establish an online company voice that reflects your business values and matches your customers’ expectations and you’ll go a long way in building overall trust. Whether you’re a small startup or a major company, successful long-term social media campaigns aren’t built in a day. They require a capable team that can drive the project, careful planning and execution and, as you’re well aware, quite a bit of work.